Grab a fork and come on over! Finally I’ve done it! I’ll ignore for the moment that the kitchen is littered with my failed attempts and the washing up is stacked a mile high because here I have a high protein, low fat, cholesterol free absolutely scrumptious baked cheesecake. Yay!!!!! 2) In a bowl combine thoroughly all the ingredients for the base. Press into an 8” round baking pan and place in the oven for 10 mins or until a light golden brown. Removed from the oven and allow the base to cool for 10 mins. 4) Once the base has cooled spread the cream cheese filling over the top and place in the oven for 30 mins or until a light golden brown. Remove from the oven and allow to cool. 5) Place the peach slices in a saucepan together with the ¼ cup of agave nectar on a medium heat for about 10 mins. Stir regularly. Remove from heat and allow to cool. 6) In a separate saucepan on a medium heat cook the raspberries, 2 tbsps. Agave and 2 tbsps. of water together for about 10 mins – stir regularly. Optional: Once removed from the heat I like to sieve this immediately to remove the seeds. Allow to cool. 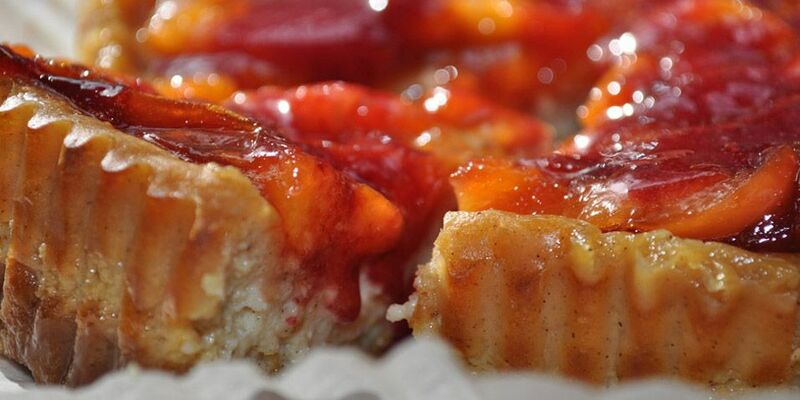 7) Once the cheesecake has cooled spread the peaches over the top and then drizzle with the raspberry sauce before placing the fridge. 8) Allow to chill for at least 4-8hrs or overnight before serving. 2) In a mixing bowl thoroughly combine all the ingredients except the milk. 3) Add the milk one tablespoon at a time until you form a dough. 4) Roll out the dough between two slices of baking parchment until about 3-4mm thick. 5) With a cookie cutter cut out the biscuits and place on a lined baking tray. If you want these for biscuit crumbs you can always just place the rolled dough into the oven. These will be soft when you remove them from the oven but they will firm as they cool.